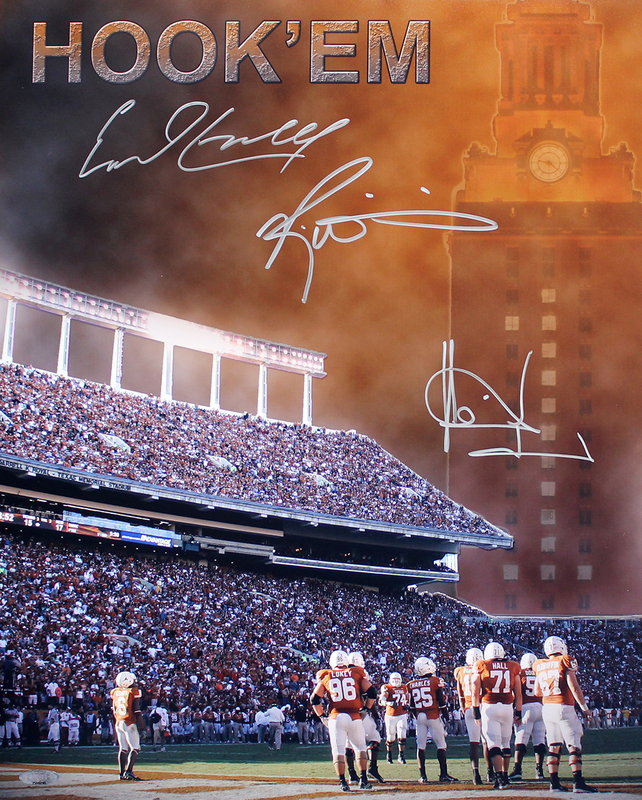 This University of Texas Longhorns commemorative 16x20 photo has been personally hand signed by UT legends Earl Campbell, Ricky Williams & Vince Young. Each autographed photo includes an individually numbered TRISTAR Authentic hologram. Earl Campbell was selected the Southwest Conference running back of the year each season he played for the University of Texas. In 1977, he led the nation with 1,744 rushing yards, and won the Heisman Trophy. Campbell was selected 1st overall by the Houston Oilers in the 1978 NFL Draft, and finished his first professional season with the Rookie of the Year award. Among his many achievements, the 5-time Pro Bowler was elected into the Pro Football Hall of Fame in 1991. Before being drafted 5th overall in the 1999 NFL draft, Ricky Williams was the star running back for the University of Texas. In 1998, he was named the College Player of the Year and was awarded the Heisman Trophy. In 2002, his best NFL season, he was a Pro Bowl MVP, NFL rushing leader, and First-Team All-Pro. Vince Young's win/loss record as a starter (30-2) at the University of Texas ranks him #2 all time for UT quarterbacks. His .938 winning percentage as a starting quarterback ranks sixth best in Division I history. Young's career passing completion percentage is the best in UT history, 60.8%. During his career at Texas, Young passed for 6,040 yards (#5 in UT history) and 44 TDs (#4 in UT history) while rushing for 3,127 yards (#1 UT's all-time QB rushing/# 7 UT's all-time) and 37 TDs (Tied for #1 among QBs/#5 UT's all-time rushing TDs). He was also #10 on ESPN/IBM's list of the greatest college football players ever.